This creative response is happening in the small indigenous coastal and island communities of northern Australia that are most affected by the problem. 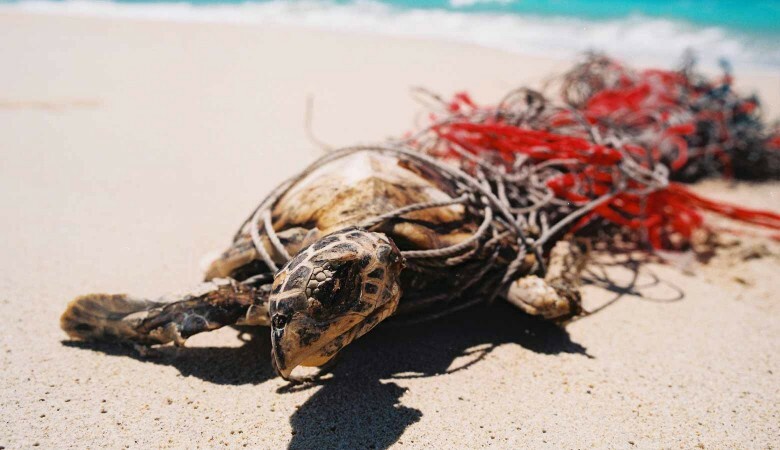 In these communities many tonnes of ghost nets – the majority from South East Asia – wash up on beaches, causing pollution, damaging reefs, and killing wildlife such as marine turtles, dugongs, crocodiles, and sharks. Ghost nets can be up to several kilometres long. Chantal Cordey’s guitar strap using ghost-net fibre. Ghost-net art grew out of a competition in 2006 sponsored by the Carpentaria Ghost Nets Programme (now GhostNetsAustralia) that challenged entrants to come up with ways to recycle ghost nets. 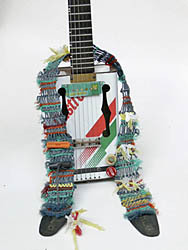 Objects such as furniture and bags were the result, and the winning entry was a woven guitar strap by artist Chantal Cordey. 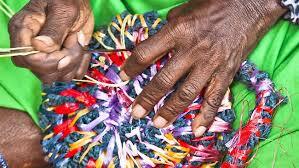 The idea caught on, and subsequently ghost-net weaving workshops were held in communities in the Torres Strait, the Gulf of Carpentaria, and on Cape York Peninsula. 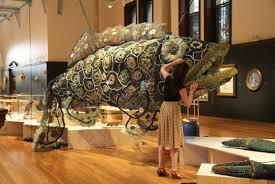 Ghost-net sculpture displayed at the Australian Museum in Sydney. It is too soon to tell if this art practice will continue, or if the words relating to it will become established in the Australian lexicon. It is possible that ghost-net art, ghost-net weaving, and ghost-net sculpture may one day appear as entries in our dictionaries. This entry was posted in artists, environment, Indigenous Australia, new words, wildlife and tagged ghost net, ghost-net sculpture, ghost-net weaving by Julia Robinson. Bookmark the permalink. Terrific. This is where humanity’s Good gets going. Oh for more please.